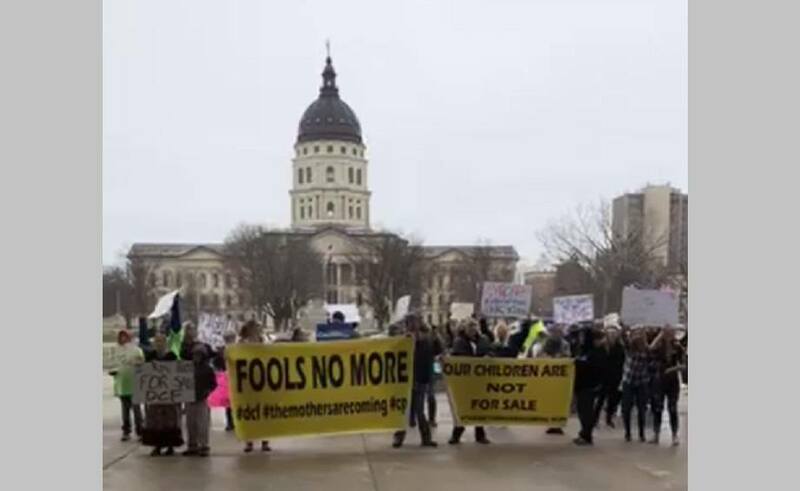 Families Protest at Kansas State Capitol: "Our Children are not for Sale!" The crowd of parents, advocates, and recently freed children say they have had enough. About 150 people braved freezing temperatures to march on the Kansas state capitol for the 3rd annual Fools No More rally on April 2, 2018. Event organizer Jennifer Winn, family advocate and former gubernatorial candidate, said: "This is about our children. All the aspects of this event are about issues that impact our children from DCF, parental rights, juvenile justice, medical cannabis; all these issues impact the lives of our children.... We are fighting for their future." Some of the most fervent marchers were children who were recently held captive in the Child Protective System, known as DCF in Kansas, and who are now reunited with their families. One such child, the 14 year old son of "Hunger Strike Dad" Raymond Schwab, was asked what he thought of what DCF did to him. There was no hint of hesitation on his part. He replied passionately: "Shut the system down!"